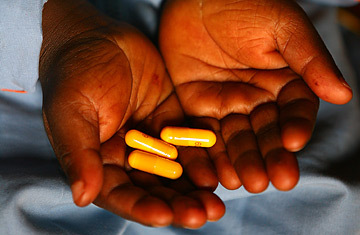 A young person afflicted with HIV holds antiretroviral pills. If you're a drug developer, HIV is nothing but a thief. All the virus wants to do is break inside a healthy cell, steal its genetic machinery, and start profiting from the intrusion. To stop a thief, you need to throw a monkey wrench  or several  into his plans. That's exactly what anti-HIV drugs, known as antiretrovirals (ARVs), are designed to do: interrupt the virus at various points along its nefarious journey. The FDA has approved four different classes of ARVs, each of which blocks a separate step in HIV's life cycle. The strategy is to build up a security detail of pharmacological agents that together thwart the virus at every turn, making sure that every receptor, protein and enzyme that the virus co-opts to sneak into a cell is covered. But nearly 20 years after the epidemic began, maintaining this drug defense is getting harder. As patients live longer on the life-saving ARVs, their virus is more likely to mutate and become resistant to the therapies. The number of patients close to running out of their pharmaceutical options continues to grow. That's why this week's news out of the annual Conference on Retroviruses and Opportunistic Infections in Los Angeles was greeted with such enthusiasm by doctors and patients alike. Drug makers reported promising results with experimental agents in two entirely new classes of ARVs, the first potential new weapons against HIV since 2003. Currently available ARVs work at both the beginning and the end of the HIV life cycle; the most recently approved class in 2003, called fusion inhibitors, start early, working to block HIV's attempt to bind and infect healthy cells to begin with. Next come the two oldest classes of drugs, which prevent the virus from transforming its genetic material from RNA to DNA. And finally, jumping to the very end of HIV's mission, the protease inhibitor drugs keep the virus from making its final protein coat, which it needs to re-emerge from the infected cell in order to start infecting additional cells. Pfizer's maraviroc, one of the two new compounds described this week, steps in just after HIV has successfully bound to a healthy cell; called an entry inhibitor, it blocks the virus from entering the cell and integrating its viral genetic material into the host cell's genome. In a study of more than 1000 patients who had developed resistance to at least three of the four ARV classes, twice the number of patients given maraviroc versus those taking placebo enjoyed undetectable levels of virus after eight months. The results were enough to convince Pfizer to apply for approval to the Food and Drug Administration, which will begin its review next month. If approved, maraviroc would be the first anti-HIV drug that targets the immune cell  by blocking the proteins that the cell uses to open the door for HIV  instead of the virus. The second drug, an integrase inhibitor from Merck, aims to tackle HIV where it hurts the most  by blocking the integrase enzyme, which the virus uses to insert its genes into a host cell's genome and hijack the machinery to churn out more copies of itself. Called isentress, the experimental agent helped 75% of patients reduce their viral load of HIV to acceptable levels, compared with only 40% of patients given placebo. All of this good news on the ARV front, however, is in stark contrast to the slower progress being made on an AIDS vaccine. "What we're seeing now with ARVs is the result of investments that were made 10 years ago," says Dr. Seth Berkley, president and CEO of the International AIDS Vaccine Initiative, a leading HIV vaccine developer. "Funding for vaccine research has always fallen far short of that devoted to drug development, and for a period, there was very little happening in the vaccine field. Had there been a sustained vaccine effort simultaneous with the drug effort, we probably would have a vaccine by now." Still, Berkley and others say that the wider range of drug options can only help vaccine makers, giving them a larger well of knowledge upon which they can draw. Yet, even as newer classes of ARVs arrive, drugs cannot be the only answer to AIDS. Already, says Dr. Roy Steigbigel of State University of New York at Stony Brook, and one of the leading investigators of Merck's isentress, volunteers have begun to develop resistance to the integrase inhibitor  a drug that hasn't even yet been approved by the FDA.